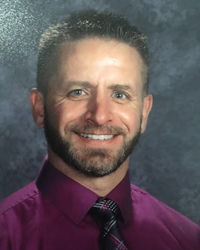 Illinois Elementary School Association Executive Director Steve Endsley has announced the hiring of Chris Frasco as the IESA's newest Assistant Executive Director after the June 16 meeting of the IESA Board of Directors. He becomes the seventh person to fill the administrative role which became vacant when Julie Cochran accepted a position as Director of Sports with the National Federation of State High School Associations in Indianapolis. "I am very excited Chris will be joining the staff of the IESA," said IESA Executive Director, Steve Endsley. "We had several outstanding candidates but it was apparent that Chris would bring a wealth of experience to the position. Serving as the on-site manager for our baseball finals and Class AA state track and field meet gives Chris a great foundation for understanding the role of the IESA in the interscholastic program of our member schools. I have been very impressed by his organization of those two state activities which bring thousands of students and parents to the finals. Chris has strong communication and technology skills and he is well-respected by his colleagues. He is going to a great addition to our staff and I am anxious for him to start. We are looking forward to him being a part of the IESA team." After graduating from Peoria Notre Dame High School in 1993, Frasco served in the United States Marine Corps in the Corporal Communications Platoon. After completing his military service, he enrolled at Illinois State University graduating in 2002 with a degree in physical education. Frasco has spent his entire professional career at East Peoria Central Jr. High School working initially as a teacher and most recently serving as the assistant principal and athletic director for the school. He completed his graduate studies from St. Xavier in 2014. During his time at Central, Chris has been the head coach for baseball and basketball; served as an assistant varsity baseball coach for East Peoria High School; head golf coach for EPCHS; and was an IHSA licensed basketball official for six years. His duties as assistant principal and athletic director at Central JHS included serving as the on-site manager for the IESA state baseball finals that are held at EastSide Centre in East Peoria and the on-site manager for the Class AA IESA state track and field meet also held at EastSide. It is anticipated that Frasco will have administrative responsibility for the sports and activities of softball, girls and boys basketball and scholastic bowl as well as yet to be determined responsibilities related to programs and awards. Frasco will start his duties with the IESA on July 3, 2017.